Our coaching directory is primarily aimed at supporting clients who are trying to achieve new habits. For that reason, we only list coaches who are certified in our Digital Coaching Methodology and are offering our built-in habit coaching package. Step #1. Complete the Digital Coaching Certification. Certification includes training, a certification test, supervised coaching of four clients, and role reversal where you build a new habit for yourself with a coach of your own. Get started by reading the Certification Resource Center and then following the steps in your Coaching Dashboard. Step #2: Make yourself available for referrals. 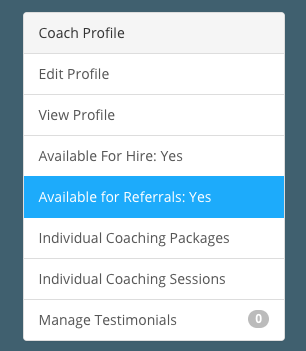 In your coaching dashboard , find the section marked "Available for referrals." Then mark yourself available for referrals. You will get referrals from us and from other coaches. While you do that, also pick a category to focus on in the Coach.me directory. Inside the directory, we will feature you within your chosen category as long as you are coaching one of the featured goals within your category. The list of featured goals is below.